So...excited (not) that it's way too dark at 6:00AM I head down to KPapa's. Wind is howling in the wrong direction but it has been backing off as the sun comes up. I get there and Tracey is already out. Not much in waves but what does come through is really clean, regardless of the wind. The most fun of the morning was paddling with a pod of dolphins for a few hundred meters. One almost takes Tracey down, lucky for her it wasn't that pit-bull sea-lion that has been hunting her down. Now that the swell has backed down and everybody is back into the "seasonal swing" of things the beaches seem a little more inviting. Anybody that lives next to the water understands this. Better parking, no lines, lighter line-ups.... yeaaa. It usually happens to most of us right around this time. Just as we're all getting a little tired of the summertime situation, school goes back in session and the fun begins. Today was one of those days. Having the option to stay longer, after 45 minutes of decent surf with limited crowds it was satisfying enough to just get out and start the day off right. If you look closely there is a guy beach boy style in the background. there's lots of paddles and boards and some standing up, just not all at once. this one qualifies to be posted, solely because of the fun factor! CrowdSourcing- kind of. Taking that it's a business term and this morning seemed a little more business-like down at our favorite Stand Up Paddle Surf spot. Our humble Kaulapapa is an SUPS friendly sanctuary. Allow me to break it down. The short board mentality of "I gots it" or the whistling and calling people off waves is not welcomed, by us that Stand Up Paddle Surf here every day whether it's good-n-glassy or big-n-blown-out; nor by the other wave riders and gliders that cohabit K-Papas with us. And it's a sanctuary because unlike neighboring counties where it's not a legal action to go Stand Up Paddle Surf in your backyard, we are limited in these here parts. Which brings me back to Crowds. Nobody likes it when you roll up with a dozen (or 25) of your buddies. Especially with the burnt out attitudes. 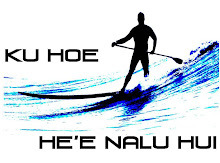 This sport is all about the fun, and Kaulapapa's is a wave that facilitates it. It's not Pipeline where there's barely room for one waverider. Don't let the rumors be true, "all of a sudden a SUP'r showed up and ruined everybody's day". Don't be that guy.